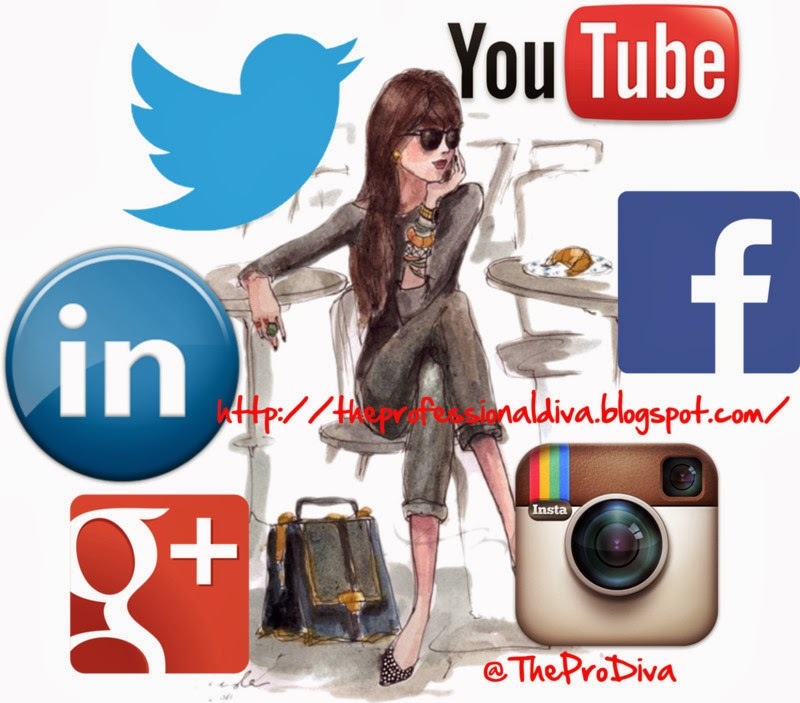 THE MARTINI CHRONICLES: 5 Ways Social Media Can Tank Your Job Interview...Before It Even Happens! 5 Ways Social Media Can Tank Your Job Interview...Before It Even Happens! So, I know this post may seem lame to the younger Divas and Gents who have not yet entered the work force (and some of the older ones who have already entered the work force), but trust and believe that prospective employers are actively using search engines to get a glimpse of their prospective employees before meeting them. Over the past several years, individual social media accounts have often resulted in individuals not being offered a position due to its content. Additionally, the content of an individual's social media accounts may be the basis for termination. Is sharing every aspect of your existence really worth not obtaining (or losing) a job? In the age of Facebook, Twitter, Four Square, Tumbler, LinkedIn, YouTube, Instagram, etc., people have become more and more comfortable sharing every aspect of their lives with their "friends" and "followers." Believe me, I get it! Using social media as a form of communication is easy, fun, and cheap. I myself am an avid user of many of these mediums, and I enjoy them. 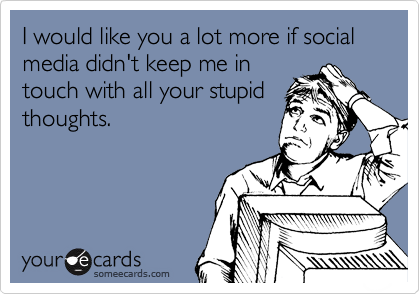 But when you are a professional, you have to be cautious when using social media in your personal life. This is particularly important when one is actively seeking employment, and looking to start his or her career. To this end, I have created a list of 5 ways in which social media can tank your job interview before it even happens. Enjoy! 1. Inappropriate Pics - Yes, you are a junior in college. Yes, you are entitled to enjoy your college years. Yes, extreme partying is bound to happen at some point during your collegiate tenure. Yes, your parents are still supporting you, and there's no need to get a real job until after college. While all of these assertions may be true, you have to be aware of the fact that you do, at some point, intend to graduate and enter the job market. And when you do, the last thing you want prospective employers to see when they conduct a Google search of your name is a picture of you half dressed and taking tequila shots at a frat party. Or a picture of you baring it all at the beach with your friends during spring break. Or a video of you dropping it like its hot and behaving in a way that would make your parents cringe. Or a picture of you dabbling in both legal and illegal substances. Unless you are interviewing for a position where the behavior described above is desirable, chances are a prospective employer may be influenced in a negative way by the content. Do yourself a favor and don't post or share these items via social media. 2. Reposting and Sharing Questionable Media - Let me keep it real with you...I see some of the funniest things on social media. Pictures with hilarious captions. Videos of foolish-behaving people. Hysterical memes. They keep me in stitches. But while some of these items are funny to me, I would not repost or share about 95% of them. The fact is that a lot of these items may be of questionable taste; some folks look at them and move on, and some folk may be offended; it depends on the person. Because you are often unaware of where your prospective employer falls on this spectrum, exercise caution and restraint when reposting and sharing these items. Need an example: Don't post a video of a woman punching another women in the face with the caption "LOL," and then go on an interview to be counselor at a women's shelter....not a good idea! 3. Blasting Past Employers - So, you hated your old job. I mean you hated everything about it...your boss...your co-workers...the coffee...you HATED your old job. Guess what...your Facebook friends and Twitter followers should not know that you hated your old job. And even more important, your prospective employer should not know that you hated your old job. No one wants to hire someone who blasts their former employees. Not only is it in bad taste to do so, but your prospective employer may be concerned that you will blast him or her in a moments notice. Employers don't like to be embarrassed...period! My suggestion: just don't do it! 4. Telling on Yourself - True story: I recently saw a picture posted on Facebook of a women at a bar, in a football jersey, with a beer in her hand, smiling from ear to ear. The caption: "Had to call in sick. The game is on! Damn you influenza!" Seriously!? So, she called in sick from work, posted a picture of herself partying, and then she alerted her employer (or a co-worker) that she had the "for play play" flu. How about the person who took the day off from work to go on a job interview, and then checked in on Four Square with the caption "Pray for me! Interview for this new gig on deck!" Or how about the lawyer who posts Instagram pictures of himself at lunch having several alcoholic beverages, and then he shows up for court in the afternoon. Folks...don't do this! Or anything like this. You never know who may be lurking around your social media pages. And if the lurker is a prospective employer, he or she may think twice about hiring someone who is outwardly and unapologetically dishonest. 5. Using Offensive Language - Do I really have to discuss this point? You know the offensive language I am talking about, so I won't elaborate. But I will say this: you never know who you may offend. Including your prospective employer. Rule of thumb: If you can't say it on TV and the radio, don't say it on social media. Although social media has become the hottest way of quickly communicating with the most amount of people, we as professionals have to be cognizant of how we are using these forum. 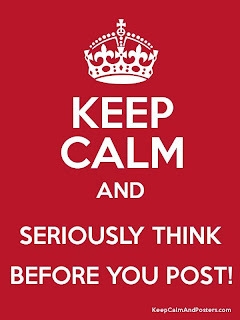 As such, please be cautious when using social media, and think before you post. To my younger readers who have not yet entered the work force, please be aware that your social media content is now part of your job application and can be used to tank your interview before you even show up. In all instances, take the proper precautions to keep your account as private as possible and be selective with who you allow to "follow" you and who you "befriend." And remember that deleting questionable content may not be enough. In any event, socialize wisely! 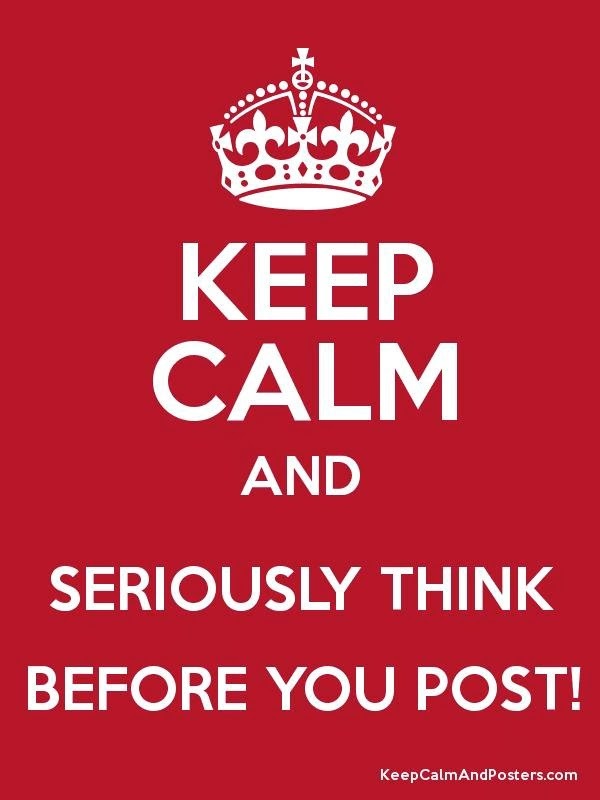 Can any of you think of other precautions professionals should take when using social media? Let me know in the comments below (no rhyme intended! )!